Patrons of Armadillo Ale Works were greeted with the gentle aroma of herbal remedies while browsing through items for spiritual cleansing. Guests sipped their beers and enjoyed live music while purchasing ceremonial tools made from porcupine quills and raccoon bones. The first ever Pagan Pop-Up event was held from noon to 8 p.m. on Jan. 27, inviting locals to unite in a safe space where people of all faiths are accepted. The event was hosted by Brujaus, Armadillo Ale Works, Horror Freak and Marrow & Moss and featured more than 20 vendors, live music and food. Attendees participated in a silent auction and had their tarot cards read while mingling with other members of the community. Two Pagan Pop-Up attendees inquire about a wet specimen at the Horror Freak booth. Horror Freak, Brujaus, Marrow & Moss and Armadillo Ale House presented the event that was created as a way for pagans to feel at home. Image by Adriance Rhoades. Among the vendors were Wendy and Bear Griffin, owners of Artio Artisanals. Both were quick to express their passion for holistic healing and their commitment to the craft. Artio Artisanals sells handcrafted items, including jewelry, essential oils, stones and ceremonial tools for shamanic healing. Their smudge fan, for example, has multiple spiritual uses. The couple from Fort Worth turned their hobby for holistic healing into a business in 2017 when Wendy resigned from her teaching job, and Bear retired his tattoo shop. Wendy said their shop teaches people how to heal themselves and provide them with the tools to do so. Bear said paganism is having an understanding that humans are all connected and all looking for the same answers. When looking back at the origins of religions, he said, most of them all have the same underlying theme: Be good to those around you. He said while belief systems fall under different names and hold different rituals, he believes they all have the same answers. Wendy said people do not have to be full pagans to come to pagan events and purchase items. She said the community is accepting and even those with little to no experience in paganism are welcomed. Another pop-up vendor present was the new Cicada Song Studios, emerging from the partnership between Marrow & Moss and Robyn’s Nest Artwork. UNT psychology senior Haley Justitz, creator of Robyn’s Nest and partner of Cicada Song Studios, said the studio specializes in both pen and ink and charcoal art prints. They also collect bones to use in the displays they sell. Justitz said that while she is relatively new to the pagan community, she believes events like Pagan Pop-Up help provide a sense of belonging for both those new to paganism and long-time believers. Pagan Pop-Up also hosted vendors like Horror Freak, which sold items outside of holistic healing. Fort Worth resident and Horror Freak owner Eric Dallof created the first full horror shop in Dallas-Fort Worth with the opening of his Hurst location in June 2018. Dallof’s table featured prints and figurines for horror fans. Pagan Pop-Up combined the opportunity for pagans to meet others in the community with the opportunity to serve it. The event raised money for the Presbyterian Children’s Home in Denton, and by the end of the night, they raised $730 in donations. The pop-up also facilitated relationship building with local vendors and fostered support for small businesses, something Wendy stressed the importance of. Many holistic products have recently been adopted by larger chains, with companies like Urban Outfitters selling crystals and incense bundles. Bear said mass-producing, larger corporations do not put the same heart or care into making and selling their products as local vendors. 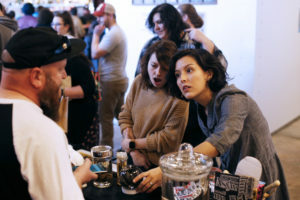 Bear, Wendy and Justitz all said they were surprised about just how successful Pagan Pop-Up was as a first-time event. People who missed out on its first run don’t have to worry though, as it was advertised as a “Volume 1.” Replying to a Facebook post on the pop-up event’s Facebook page, Brujaus said there are plans to hosting another event in the summer or fall of this year. 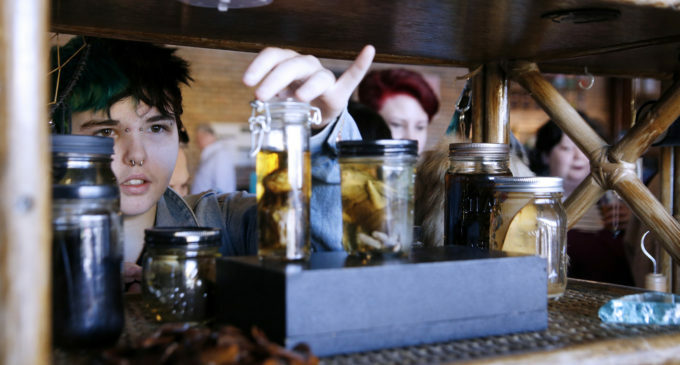 Featured Image: A Pagan Pop-Up attendee views wet specimens at the Artio Artisanals booth run by husband-and-wife team Bear and Wendy Griffin. Image by: Adriance Rhoades. This is the best article I’ve read so far! Thank you soooo much!